Had you asked me this 5 years ago, I would never have imagined encountering one rhino, let alone participating in the plight of the remaining 20 000 odd rhinos. 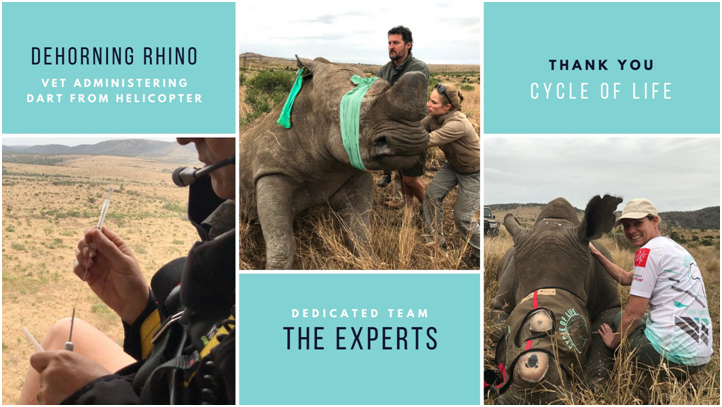 As most of you know, Simone, Renè and I cycled in The Cape Town Cycle Tour to tick it off our bucket list – however, we felt we needed a cause and since Simone is passionate about the bush, the obvious choice was cycling for rhinos. Me…. I was happy to be part of the team and festivities. Forward 5 years later, over a million rand raised and countless rhinos dehorned. Let me share one of the most heartfelt 3 days of my life. Thanks to the awesome work of The Cycle of Life™ I got to go to KZN firsthand and document 15 Rhino’s being dehorned. Funded by The Cycle of Life™. Day 1: After a 5 hour journey from Cape Town, I arrive safely at the newly renovated Bayala Private Safari Lodge (3 hours North of Durban) I’m welcomed by familiar friendly faces and an iced tea. Bayala has generously sponsored the duration of my stay. Day 2: I’m off to an early start. At 5:45 JR, my incredibly knowledgeable ranger, who I’m convinced, was born in the bush, eagerly awaits. … we’re off with the excitement of what the day has to bring. The agenda is to dehorn 5 rhinos. The Phinda Conservation Team consists of Simon Naylor, the very capable conservation manager of the 30 000 hectare Mun-ya-wana Reserve. Then there’s Trevor, the highly skilled wildlife vet, a gorgeous helicopter pilot accompanied by an uber rich Texan who sponsored the use of the helicopter. The rest of the team is made up of volunteers, researches, assistants and other very professional looking people. Whilst the helicopter hovers above, the confused white rhino and her 2 year old calf run blindly. Vet Trevor administers the opioid dart from the heli, takes aim and accurately darts her in the rear. The anesthetic immediately takes effect as she slows down and her 800kg body clumsily falls to the ground. With slick precision the Phinda Conservation Team covers her eyes with a blindfold and plugs her ears to drown out any sound. And so the perfectly skilled process is executed. The horn’s length and circumference is measured, the ears are notched, DNA and blood samples are taken for research and identification. The horn is measured about 5 cm’s above the base and the dramatic sound of a chainsaw powers up. Skillfully the vet saws the horn off and with the same skill continues to saw off the smaller horn above. The stump is then trimmed, smoothed and covered with tar to prevent infection, cracking and drying. The vet then reverses the anesthetic and the cow stumbles to her feet in a daze to desperately seek her baby. 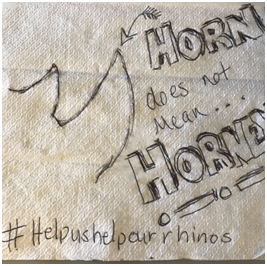 So you ask …what happens to the horn? – It’s micro-chipped and flown off the reserve to a vault somewhere in Gauteng. Did you know that the horn grows back every 18 months to 2 years? – Yes, dehorning is quite an expensive process, from about R20 000 per rhino. The rest of day 2 was thrilling – after dehorning 4 white rhinos we dashed off to the South Eastern side of the reserve to an area called Lulubush – For conservation purposes the fences around Lulubush were dropped, allowing the animals more space to traverse. Day 3: Thankfully we had a little sleep in and a hearty Bayala breakfast – dutifully JR was ready and waiting at 11 am. The plan was to head back to Lulubush to locate more black rhinos. Fortunately the generous Texan decided to take a days rest and Simon offered me the opportunity to accompany Vet Trevor and a very pretty navigator in the Heli – Yipppeee – I was beyond excited as this was a luxurious heli with light leather upholstery. Feeling like a celebrity the heli’s blades sliced into the afternoon sky, and we were on a mission to find black rhino. If day 2 was a success then day 3 turned out to be a hit-and-miss affair. Now, black rhino are a little bit of crazy, you’d think you’d easily spot a 600kg rhino from the air but not on this particular day. When we eventually spotted 2 black rhinos, they rolled their tails up and dashed straight into the dense bush. We managed to track them for a pretty long time but being black rhino they just never let up. Trevor attempted to dart one of the rhino and missed. After the second dart the poor fellow fell head first into a ditch. We hurriedly landed the helicopter and navigated through the thorny shrubs to locate the darted rhino. He was lying in an awkward position and the vet had to reverse the drug and wake him up before any harm was done. 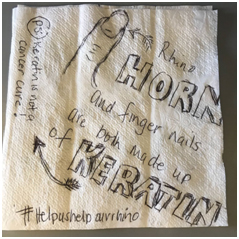 Not all was lost as we went on to dehorn 3 black rhino in quick succession – bringing the number to 15 dehorned rhinos over 3 days. Departure Day: We thanked and bid farewell to the hospitable Bayala family and headed back to Cape Town feeling like a deflated balloon. So, what does rhino hide feel like? The skin is pretty thick, a little bit rough with bristly hairs adding to the tough texture … A feeling I’ll never forget.